Volume 2 surveys the economic history of the United States, Canada, and the Caribbean during the nineteenth century. 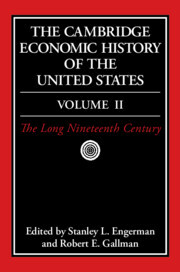 Five main themes frame the economic changes described in the volume: the migration of labor and capital from Europe, Asia, and Africa to the Americas; westward expansion; slavery and its aftermath; the process of industrialization; and the social consequences of economic growth that led to fundamental changes in the role of government. Other topics include inequality, population, labor, agriculture, entrepreneurship, transportation, banking and finance, business law, and international trade. 1. Economic growth and structural change in the long nineteenth century Robert E. Gallman; 2. The economy of Canada in the nineteenth century Marvin McInnis; 3. Inequality in the nineteenth century Clayne Pope; 4. The population of the United States, 1790–1920 Michael R. Haines; 5. The labor force in the nineteenth century Robert A. Margo; 6. The farm, the farmer, and the market Jeremy Atack, Fred Bateman and William N. Parker; 7. Northern agriculture and the westward movement Jeremy Atack, Fred Bateman and William N. Parker; 8. Slavery and its consequences for the South in the nineteenth century Stanley L. Engerman; 9. Technology and industrialization, 1790–1914 Kenneth L. Sokoloff and Stanley L. Engerman; 10. Entrepreneurship, business organization, and economic concentration Naomi R. Lamoreaux; 11. Business law and American economic history Tony Freyer; 12. Experimental federalism: the economics of American government 1789–1914 Richard Sylla; 13. Internal transportation in the nineteenth century Albert Fishlow; 14. Banking and finance, 1789–1914 Hugh Rockoff; 15. US foreign trade and the balance of payments, 1800–1913 Robert E. Lipsey; 16. International capital movements, domestic capital markets, and American economic growth, 1820–1914 Lance E. Davis and Robert J. Cull; 17. The social implications of American economic development Stuart Blumin.